My first time with MNW, it was a somewhat different experience to what I get at MLF. 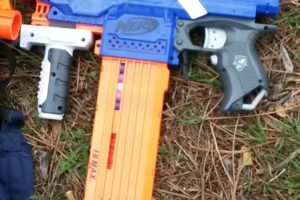 In this Nerf game report, I’ll be providing an overview of those differences, along with some of the blasters on-hand, the play area, and a summary of how our games played-out. MNW has a document on the rules here, but I’ll go through them anyway. They’re basically the same as MLF, with a few extras. If a player is hit with a dart, they are downed (“hit” and “downed” are often used interchangeably). When downed, they can choose to wait for a medic, or go to respawn (if the gamemode has respawns). If the downed player chooses to respawn, once they move from their spot they can no longer be revived by a medic. A melee tag also forces a player to respawn. If a melee weapon is not available, the attacking player can simply tag the target player with their hand. A shield blocks darts, but breaks when hit by a grenade – the shield must be dropped immediately and cannot be used for the rest of the round. There was only one available so it was only used for assymetric gamemodes. A medic revives a downed player by placing their hand on the player, counting to 3 (at a reasonable speed). Once the countdown is complete, the downed player is revived. Up to 2 per team, depending on gamemode and team size. There are several other special ammo types and “team items” that weren’t used this event, so I won’t mention them here. The gamemodes are very similar to the ones at MLF, though we played a lot of instant elimination games. Capture the Flag (CTF) – classic gamemode, steal the enemy’s flag and return it to your flag at your base to win. Drop the flag if downed while holding it. Team Deathmatch/Elimination (TDM) – Last team standing wins. May or may not have medics. May or may not have ammo limits. *NEW RULES* There is an additional SF player labelled the VIP. 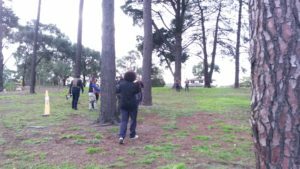 They start in a set location and are unable to do anything (and are untargetable) until tagged by an SF player, at which point they join the SF team as a normal player. If the VIP reaches the extraction point, SF win even if there are surviving Insurgents. 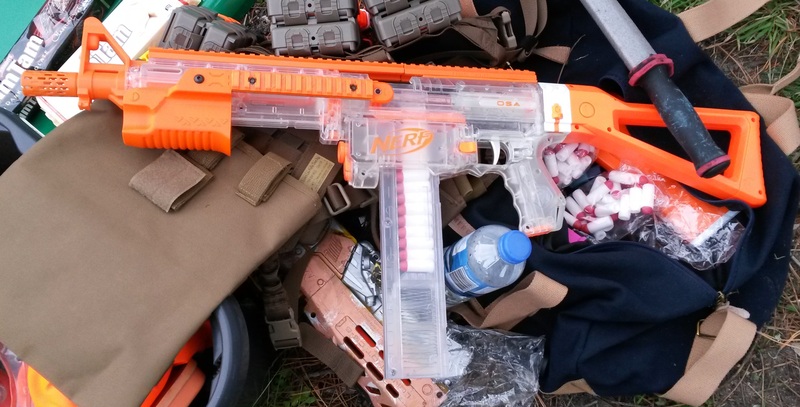 Since this was my first MNW event, I haven’t seen firsthand what sort of blasters are common. I imagine it wouldn’t be too different versus MLF since I’ve seen a lot of these at MLF, with the exception of allowing more powerful blasters. 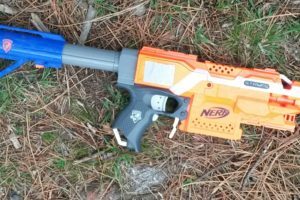 N-Strike Longstrike (XBZ air tank, compressor) – a blaster that actually lives up to the sniper aesthetic, it’s extremely powerful, and was the most powerful blaster today. 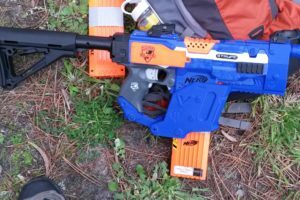 Due to a shorter than ideal barrel, it’s not particularly accurate, and being an air blaster is also far slower to fire than any other blaster. 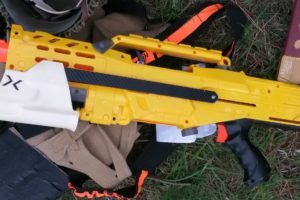 A useful support and potshot blaster, especially at surprising or suppressing enemies, but overall not that effective in direct combat. 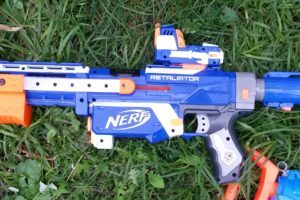 Elite Rapidstrike (various motors, LiPos) – didn’t see many of them today, only my two and one other RS. They worked fairly well, high ROF making them excellent for close-mid range but rather lacking at longer range as usual. 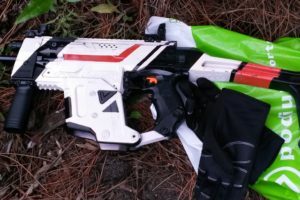 My Bullpup RS decided to break itself in the middle of the second game, with the cycle control switch getting stuck in the normally open position. While it was still usable, the pusher coasts to a stop instead of braking when it reaches rest position, which I absolutely cannot handle as I like to fire bursts. I have replaced the switch and it works fine now, thankfully it’s something I can easily fix. I believe my pusher motor may be damaged however. My RS Rifle worked excellently for the rest of the event, up until the very end when the pusher decided to jam somehow. 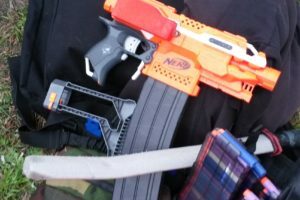 Thankfully the dead centre wiring meant that the pusher wouldn’t be trying to destroy itself unless the trigger is pressed, and I was able to fix it up once arriving home. 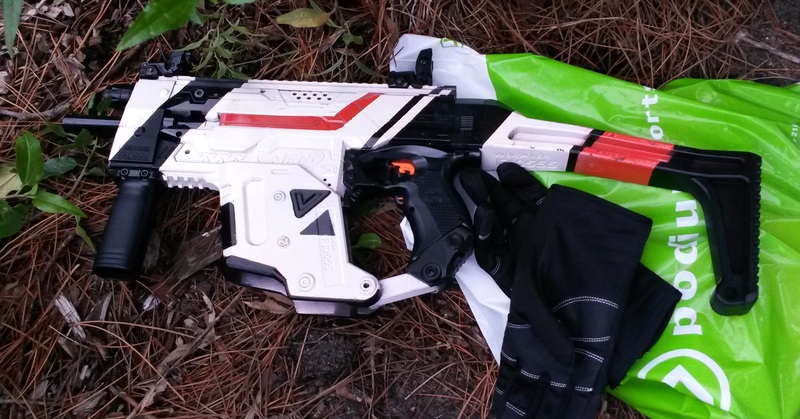 In terms of performance it felt almost identical to my Bullpup, with the same sort of firepower and ROF. 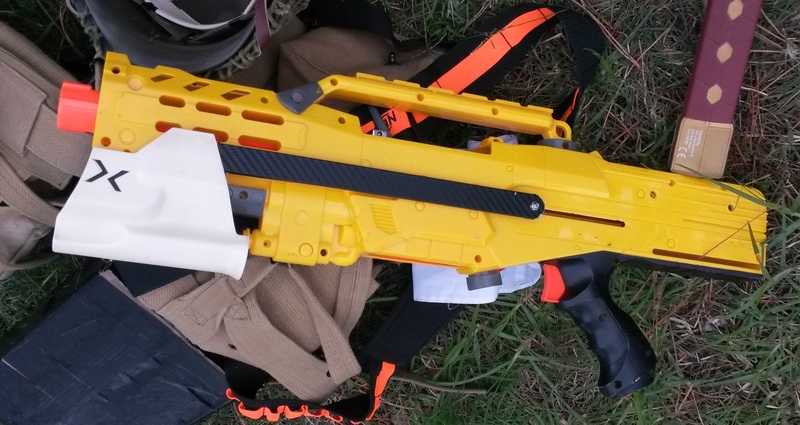 As such it makes an excellent backup blaster, but I’d personally rather run my Bullpup given the choice. 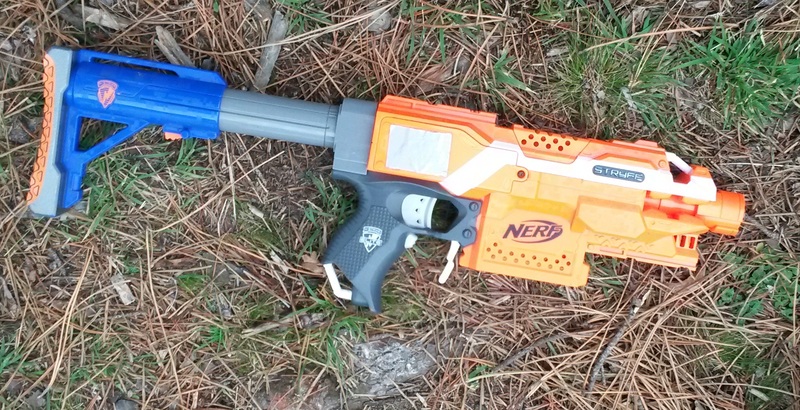 N-Strike Longshot (exact mods unknown, but strong springs and pump grips) – powerful and relatively accurate blasters, they worked very well at longer ranges. They are rather slow to fire so are a lot less effective against multiple enemies in closer range. 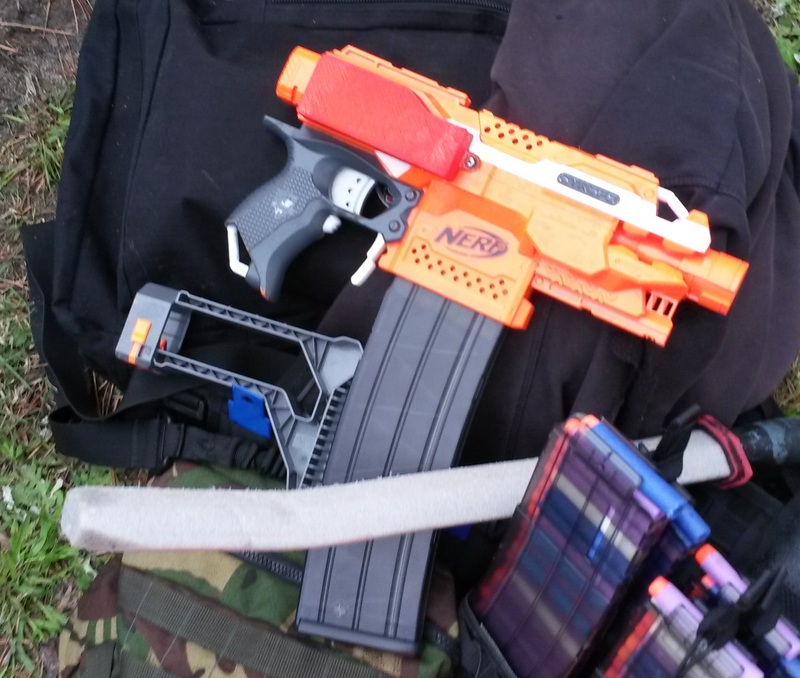 Elite Retaliator (pump grips, various internal upgrades) – saw a couple of different ones today. The two standard ones worked as per usual, decently powerful with an ok ROF, not especially notable but a relatively good and easy to build springer. There was an Artifact breeched pump Retal at the event, which was cool to see, the first time I’ve seen one in action. 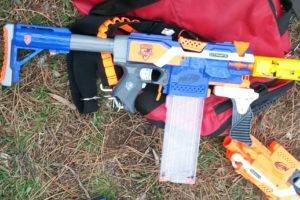 It appeared to have better range and superior accuracy compared to the standard pump Rets, but of course had to use half length darts. My personal Gavinfuzzy gripped pump Ret seemed to work better today than the recent MLF event, though still a little too inconsistent for my liking. 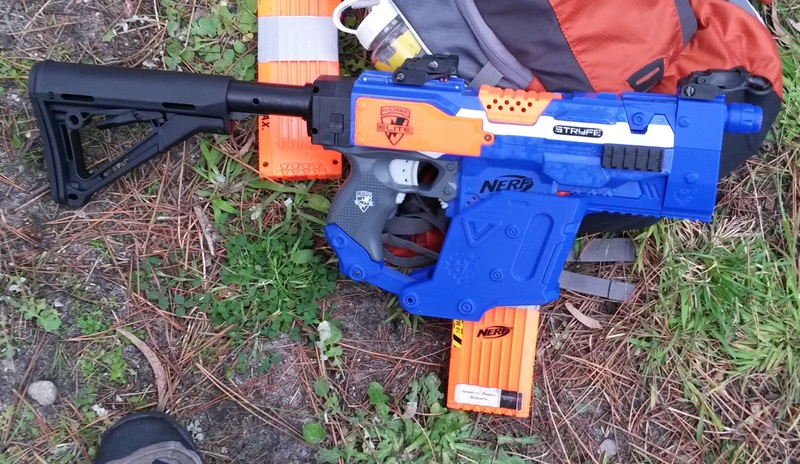 Elite Stryfe (various motors, LiPos or otherwise) – there were a whole slew of these around, ranging from just bare Stryfes with a stock to full aesthetic kits. 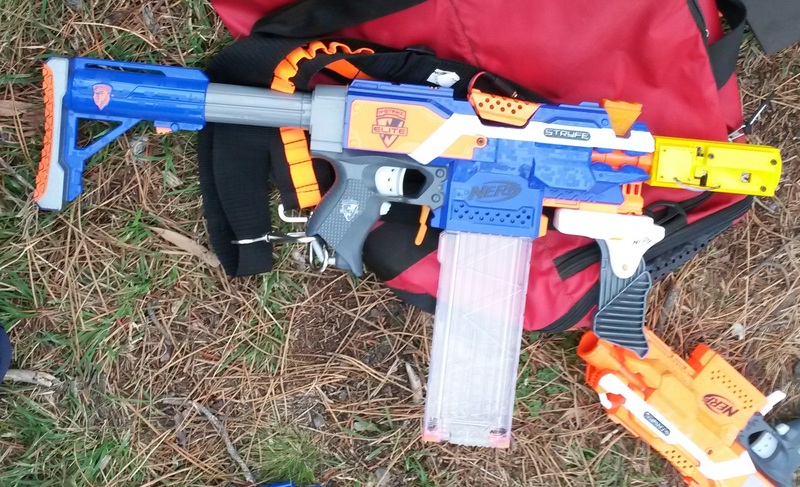 Good all round blasters as usual, solid range and good ROF, very effective entry level blasters. 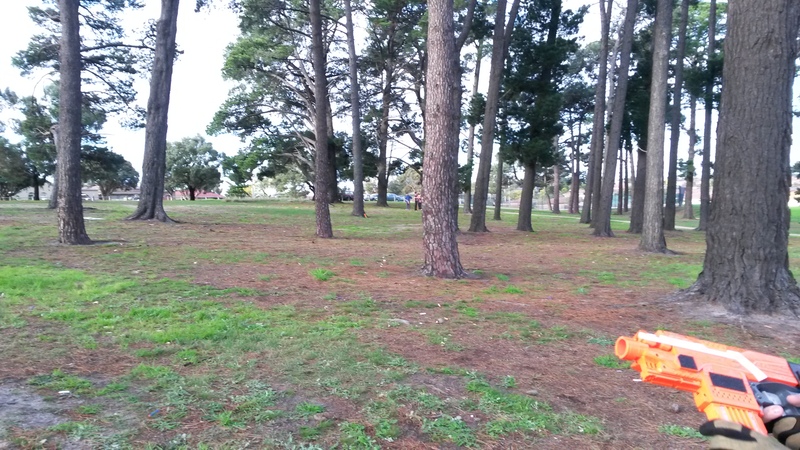 We used the same park as the first MLF play area, however we used the area just north-west of it. 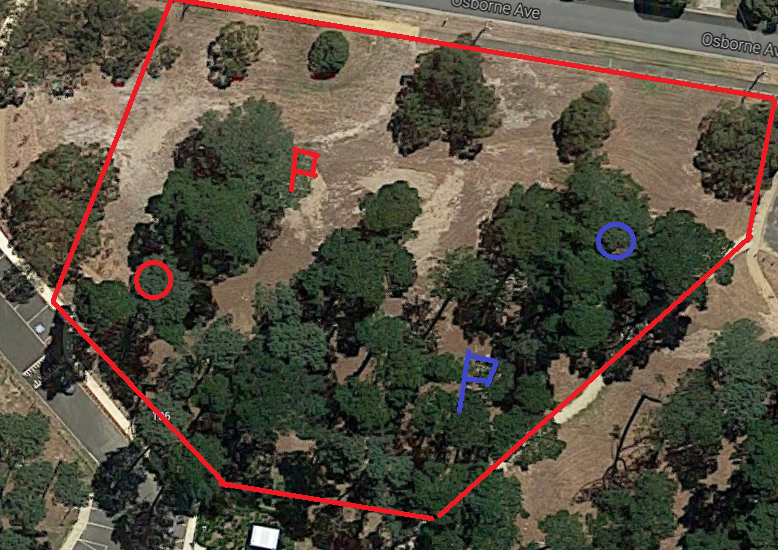 This area has a similar density and style of tree cover, though obviously has a different arrangement of trees. This area’s trees are more evenly spread out and are not aligned into neat rows, though there were still a fair number of open areas. Temperature peaked around 15 degrees C, quite a cool day. Playercount peaked at around 17 or so, which was more than enough for some relatively balanced team games. It’s also worth noting something about the overall organisation of the game. At MLF events, downtime is generally kept to a minimum between games, ignoring dart sweeps and the lunch break of course. We get a lot of games done at MLF. 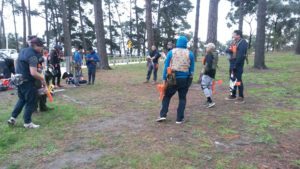 MHvZ events typically don’t have too much downtime outside of main dart sweeps and the lunch break, as those players who need to reload a lot of darts can usually do so quickly, and the players have plenty of time to converse during games due to the nature of HvZ games. At this MNW event however, there was a lot more downtime of people standing around talking rather than reloading and organising for the next game. 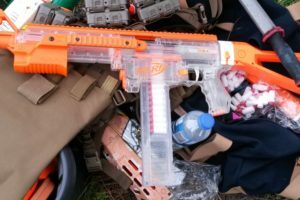 I’m all for having breaks for players to socialise and rest in, however I also attend these events for Nerf games, so I expect to play a good amount of games. I also wanted to see how MNW differed from MLF, particularly with all the extras, yet none of the new extras were brought so I didn’t get to see any of them in use. There were rocket launchers (which differ from grenades in that a rocket hit also removes the player from the game for 3 minutes), but noone bothered using them as for a majority of the games, there was no real reason to use them. 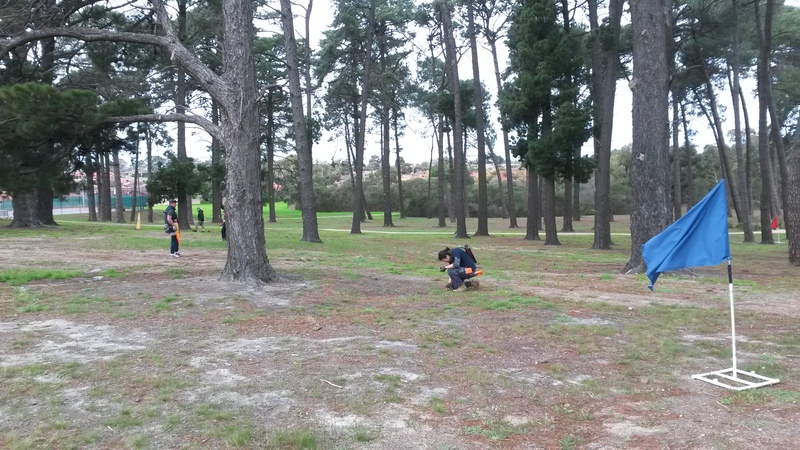 We started off with some CTF rounds, which went mostly as expected. In the first, I started in the north east and went directly for the enemy flag. Because of the flag and tree arrangement, my team had one tree just to the east of the flag to take cover behind, while the other team had just one tree to the south. The two trees were not very close together, so my teammate and I suppressed the enemy players while I grabbed the flag and ran. Our flag had actually been moved a bit away from our flag base and there were several enemies very close to our flag, so I hung back, trying to help clear out the enemies. 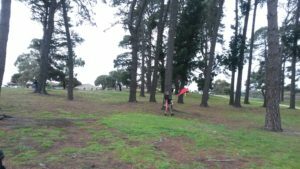 In contrast with the enemy flag base, our flag base had several nearby tree groups, with one directly west (right in line with the enemy spawn), and a couple more on the east (which we used to defend). 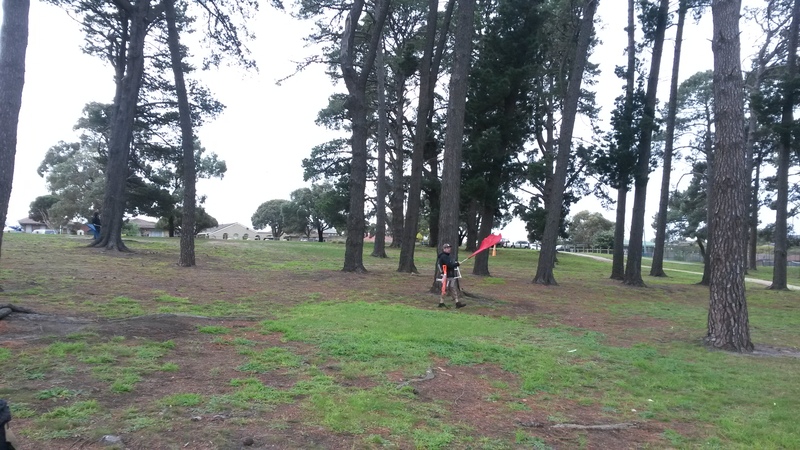 There were several enemies stacked up at the trees just west, and they had a perfect line of fire to our flag base. 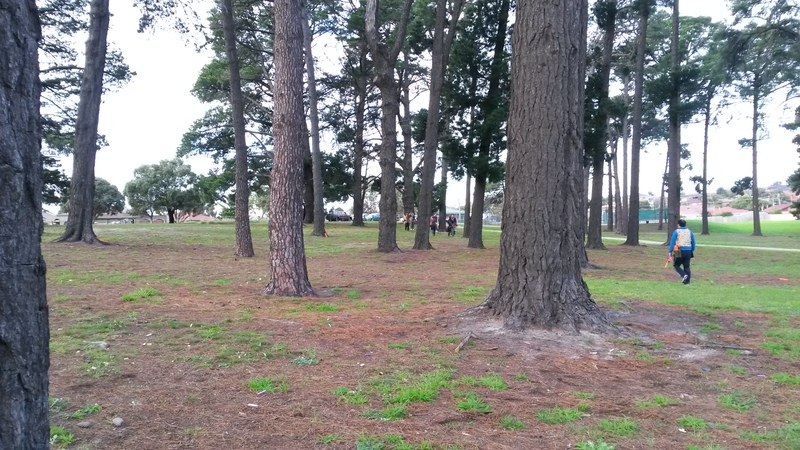 Our flag had been moved to the base of this tree group, however it was on the east side, easily within reach. Eventually I was able to get an opening and get both flags to our flag base to win. In the second, my team started in the south west. I ran straight along the south edge up to the enemy flag, however got heavily pinned down before being able to reach the flag. 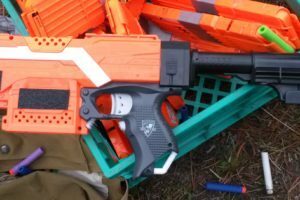 It was during this engagement that my Bullpup RS switch broke, so I was forced to fire off a lot more darts than I would have liked. I was eventually downed trying to steal the flag, and in my run back to respawn, dumped my Bullpup and picked up my RS Rifle. By the time I returned to play, one of my teammates had managed to steal the flag, so I ran up to help cover him while he successfully returned the flag. The key in both rounds was coordination. In the first round, I likely would have had a much harder time trying to steal the flag if I didn’t have backup to help suppress. Likewise I would have struggled to return both flags later on if I hadn’t had support from teammates to give me the opening. Better coordination of the enemy team would have made my job in both situations much harder, and given that they were already able to move our flag a short distance, with good coordination they may have been able to actually win that round. In the second round, had my teammates not quickly moved up to reinforce the position near where I was first downed, the enemy team would likely have been able to reestablish a defence, thus significantly prolonging the game and giving them a chance to win. 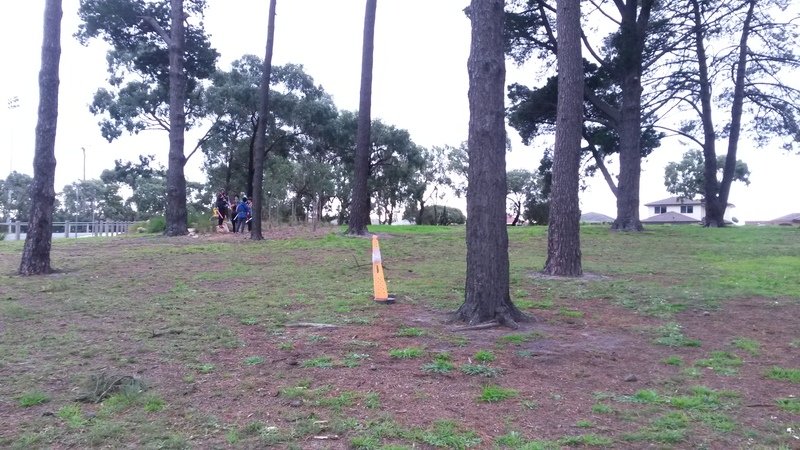 Instead, my team was able to keep up the pressure and steal and capture the flag. 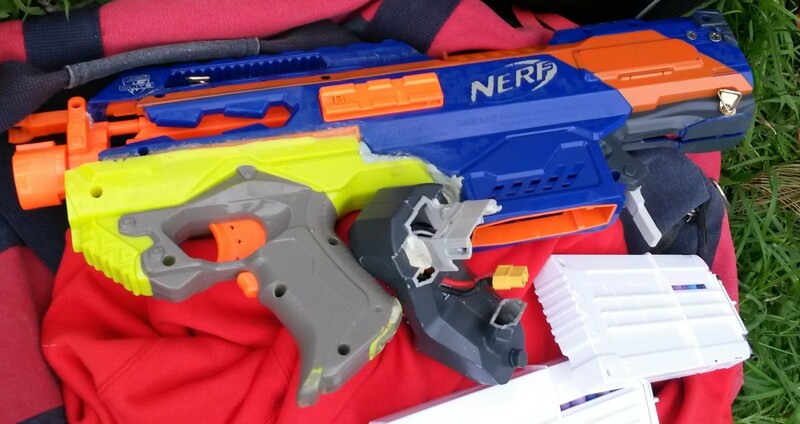 After these two rounds, I sat out of the next few seeing if I could repair the Bullpup, while also helping another player figure out the problem with his Stryfe. 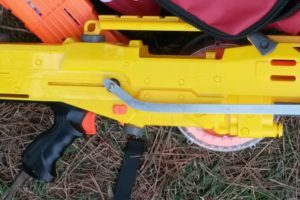 As soon as I got the Bullpup open, it was immediately obvious that the problem was a stuck/broken switch which I knew I would need to replace. 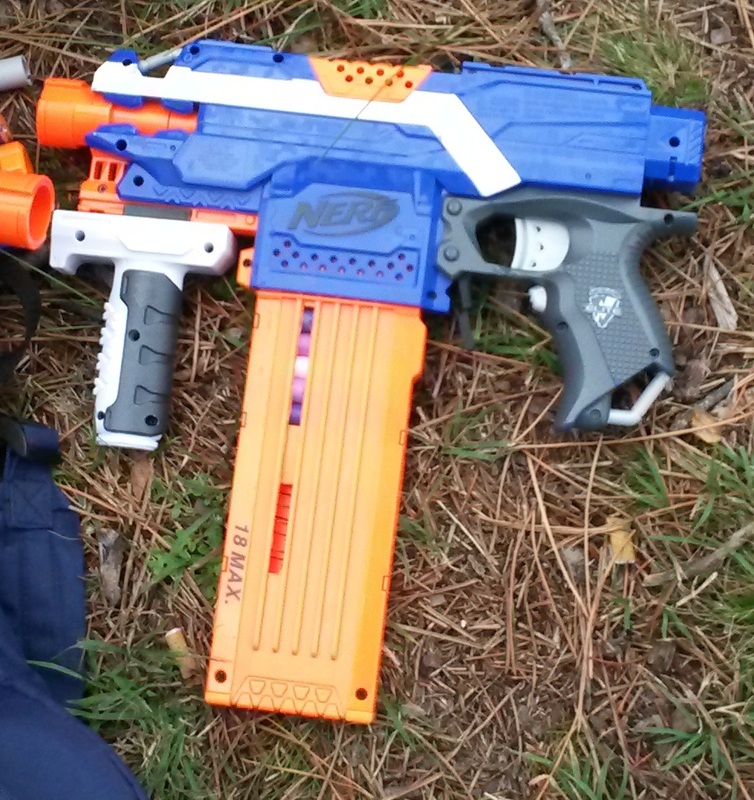 I closed up my Bullpup and got ready for the next round. I believe I missed a couple of VIP rounds as I vaguely remember people shouting about VIPs getting downed, but I was too focused on the Bullpup to be sure. We played a number of relatively short Team Deathmatches. We played two different variants, one with two teams where players only get a single 18 clip (mag) and can’t scavenge, and another with numerous small teams and a single medic for each team. I’m going to be frank, I absolutely despise games with low ammo count when scavenging is not allowed. I generally don’t like low ammo games overall, but there are instances where I will accept it (for instance 6 round sweep at MHvZ). This is not one of them. I also absolutely hate any games with instant elimination and no chance of respawn/revive or post-elimination participation (i.e., zombies). 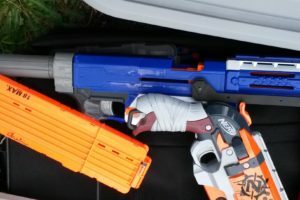 These sorts of rules leave far too much to chance, given how inaccurate and inconsistent Nerf darts can be, as well as the heavily limited ammo count. Instant elimination with limited ammo also heavily encourages camping and overly defensive play, and severely punishes offensive play, which completely and utterly ruins the game dynamic. 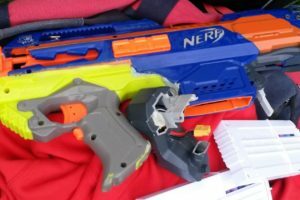 Nerf, like just about every other form of combat (real or otherwise), should be about balancing offence and defence. Overly offensive? You over-extend and get wiped out. Too defensive? You get cornered and annihilated. In this limited ammo TDM, if you play offensively, you put yourself at serious (almost guaranteed) risk of being an early casualty, and also go through far more ammo. To close distance on enemies, you must rely purely on speed and luck, as significant suppressive fire is impractical given the ammo cap, so there is a very good chance that you’ll get eliminated. Sure you might get a couple of good hits, but because of the sheer size of teams, chances are you’ll be running very low on ammo for the last few enemy players. If you instead play extremely defensively and avoid all early conflict, you preserve the majority of your ammo for late game combat. From that, you’ll usually have a significant advantage against any remaining enemies, as besides potentially having numerical advantage, they will likely have far less ammo and so will have a much harder time getting a good shot at you. The massive luck element and lack of reviving also means that there is much less incentive to work together as a team. Since most players will be relatively cautious about engaging, a lone player can much more effectively engage multiple enemies than in other team games such as CTF or VIP. Obviously there are disadvantages to being defensively, primarily that if the majority of your team plays defensively, you’re at serious risk of being flanked, but in instant elimination TDM with very limited ammo, there’s little else that will pose a significant problem. Since playing offensively puts players at such a significant disadvantage, teams are thus encouraged to play quite defensively. Which is extremely bad, especially for TDM. If I wanted to sit around not actually playing Nerf, I would stay at home on computer playing games or something. That the gamemode promotes stagnation is in itself a massive red flag that there is something seriously wrong. The game also doesn’t promote teamwork anywhere near as much as just about all other gamemodes. With a lack of ammo, you can’t rely on teammates for suppressive fire, and the instant elimination means that a lone player can easily do nearly as much damage as a pair of players. Furthermore, without any reviving, there is no need for players to rely on teammates. TDM is a team game only in name and targets, and there is not a lot of actual teamwork. Nevertheless, we played several rounds of this 18 dart TDM with 2 teams of ~8 or 9, and they were total chaos. The winner was consistently someone who had stayed back, out of combat, not contributing anything to the game until the very end. They would consistently be confronted by enemies who *had* been contributing to the game, and as such were low on ammo and so couldn’t provide a significant challenge. This, in my opinion, is completely stupid. A player should not be rewarded for doing nothing. There are a huge number of changes I can think of that would make the game better. Things like allowing players to refill their clip (mag) if they get a successful hit (so as to promote offensive play), or maybe allowing players to reload from locations specifically designed to be highly contested and vulnerable (again to promote offensive play), or maybe not playing instant elimination TDM with low ammo cap at all. I cannot think of a Nerf gamemode I enjoy less than a game where engaging in combat puts you at a disadvantage, a game where camping and avoiding combat entirely increases your chance of victory. I would be content to never play this gamemode again. TDM with medic on the other hand I find to be far more reasonable and enjoyable. We played with 4 teams of 3 or 4 players, which worked decently, though was still similarly chaotic. The presence of the medic allows for a much better game dynamic, as there is less worry about being taken out by a lucky shot, and far more opportunity to be rewarded for offensive play as you can be revived if you get downed. 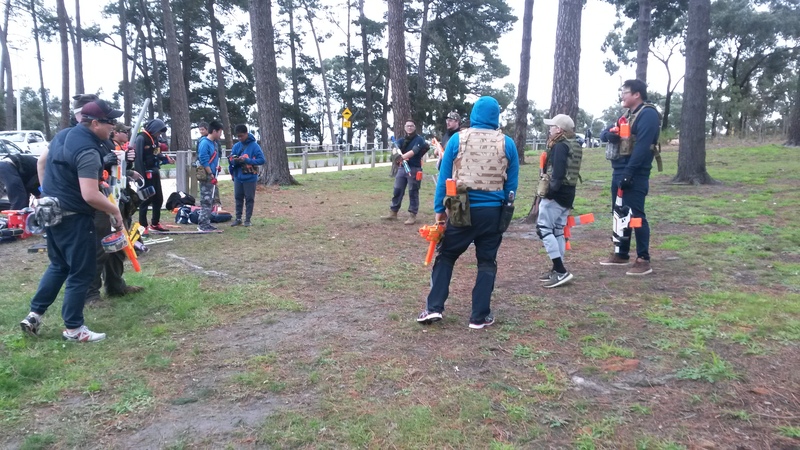 A smaller team also allows for much easier team coordination and communication, which made for more competitive and more interesting games. 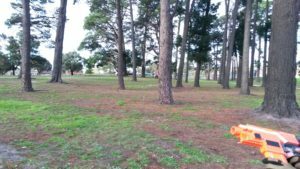 The two games that we played had very contrasting results for my team. In the first round, my team was the first to be eliminated. 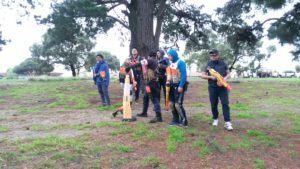 We were pinned down in a relatively poor position facing off against one team, leaving us highly vulnerable to another one of the teams. While we were busy engaged with this one team, another player from one of the other teams rushed in behind us and managed to eliminate the majority of us before we could turn to return fire. The survivors were wiped out by advancing enemy players. I believe we failed to notice this player due to poor coordination resulting in most of us focusing forward, and noone watching our flanks. Even if we had spotted and engaged this player however, my team was caught in quite a poor position and could have been easily wiped out. In the second round, my team actually won. An early potshot by our medic’s Longstrike caught an enemy player by surprise, allowing us to rush up and take down a good portion of that one team. 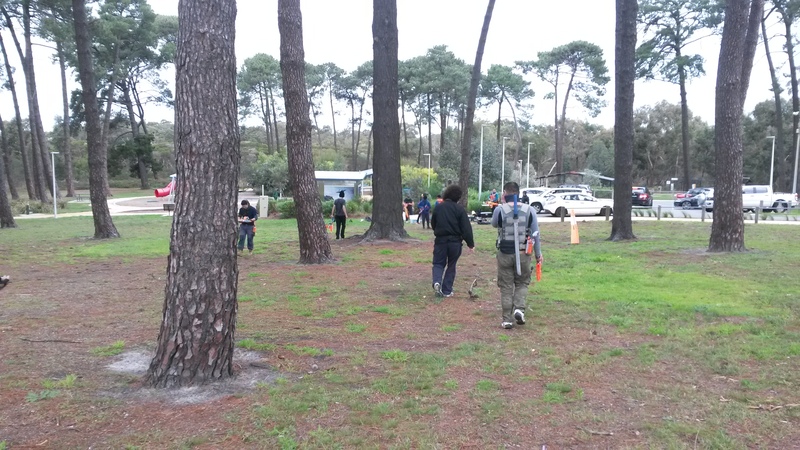 Though the survivors were able to flee, we pursued and eventually eliminated them. 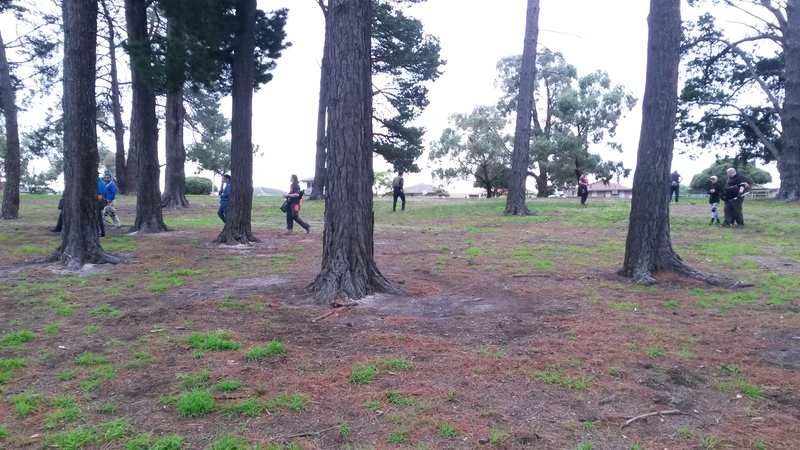 By this time, one of the teams was down to just one or two players, while the other was at full strength. My team ended up being attacked by all other players in a ~6v4, during which my team was pushed back, and one of our teammates was downed and eliminated. During this conflict we were able to eliminate the half strength team, improving our odds to a 4v3. After regrouping, my team split up to flank and attack the remaining team, with our medic staying back to draw fire and fire off potshots, while my remaining teammate and I ran around the side of the enemy team. A combined effort involving a lucky potshot or two from our medic plus some heavy suppressive fire allowed me to get in close enough to hose down all the remaining enemy players. I’ve said this many times throughout many game reports, but I cannot stress it enough: teamwork and coordination is the key to victory. In the first round, we were poorly coordinated and placed so were highly vulnerable to flanking. In the second round, better team coordination allowed us to much more effectively combat enemies, and gave us a chance for survival even against unfavourable odds. Though we still lost a player in that significantly unfavourable conflict, a well coordinated attack allowed us to catch the remaining enemy players in a relatively poor position and eliminate them all. 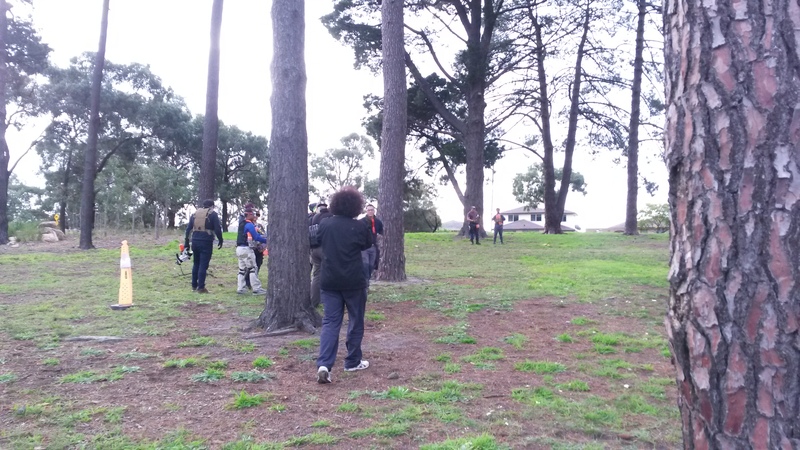 We played a few Black Hawk Down rounds, which went about the same as they normally do in MLF events. We played with 5 SF, 11 Insurgents and 1 VIP. The addition of the VIP was a nice objective addition, however was not utilised anywhere near as well as it should have been. In two of the three rounds we played, both teams were poorly coordinated and so the Insurgents won through sheer numerical and firepower advantage. The Insurgent teams were especially poorly coordinated, all too often I would see Insurgents get downed in an important location, with the medic far off, not really helping the team. Conversely, at times I also saw very poorly coordinated SF teams, with players running off on their own, or SF players not going for revives on relatively easy to reach downed teammates. The Insurgents also seemed to heavily underestimate the value of the VIP and generally didn’t put much effort into defending them. The addition of an extra player is huge for the SF team considering their numerical disadvantage and ability to revive one another. 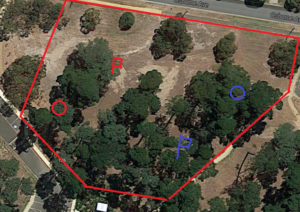 The VIP was placed in a relatively exposed location, relatively easy for the Insurgents to defend and somewhat hard for the SF team to reach *if* the Insurgents are protecting it. I feel like I say this every time, but again the only SF team to win was the one that worked together and was coordinated. Against significantly superior numbers, the SF team have a massive disadvantage if they choose to engage in a straight firefight, so their best chance of victory is to progressively combat small groups of Insurgents. If some of the SF players can down a whole group of Insurgents, they get presented with a situation that is pretty much completely favourable. If the Insurgent medic chooses to go for revives, they make themselves quite an obvious target, and as I’ve detailed in previous game reports, if the Insurgent medic is downed, the SF team has massively improved odds. If the Insurgent medic chooses not to go for the revives, the SF team can move up and eliminate all the downed Insurgents, thus reducing the numerical advantage of the Insurgents. In the one round that the SF team won, they were able to down a significant number of Insurgents, and the Insurgent medic chose not to go for revives, and so the SF team was able to push up and engage the remaining Insurgents on a much more equal footing. From there, simple good teamwork allowed them to down the rest of the Insurgents, who now no longer had a significant numerical advantage. Overall, my first MNW experience was enjoyable. However, I feel there were several aspects where they event could have been improved significantly. I absolutely despise low ammo and instant elimination games, and though I still enjoy participating in them, I enjoy them far less than a good team game like Kill Confirmed, Black Hawk Down, or just about anything else really. I would also have preferred to have a lot less downtime and more game time, and would have liked to see some of the extras that differentiate MNW from ordinary games. 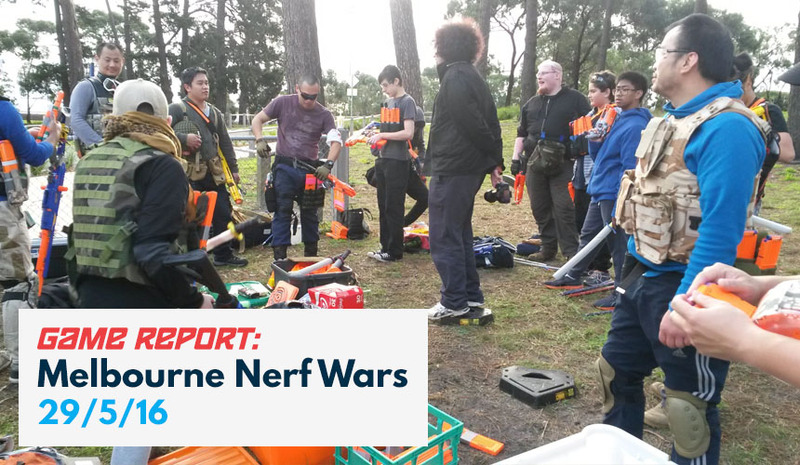 You can also find a link to the same Nerf game report on my own blog: Outback Nerf. This entry was posted in Game Reports on June 5, 2016 by Outback Nerf. 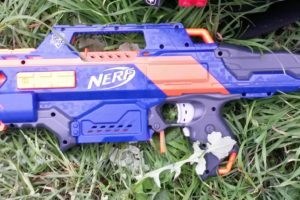 Hydrographic Magic: From Nerf Blaster to Work of Art Full-Auto Dart Zone Enforcer Revealed!